Fikri Jermadi attended the 2010 World Cup final without setting foot in Africa. ‘Match 64’ is an official account of what went on behind the scenes of the biggest match in world football. 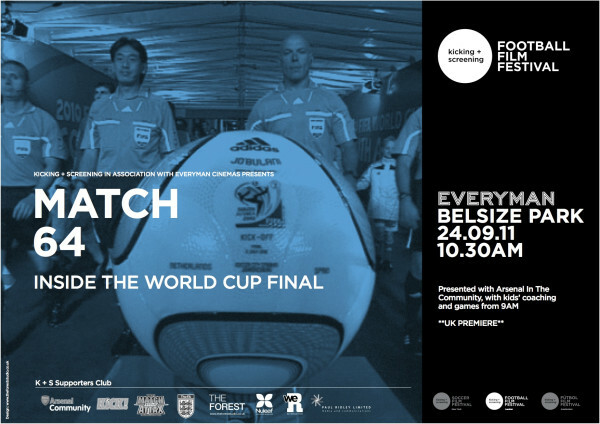 It refers to the final match of the 2010 World Cup, the 64th of the entire tournament, and it is an intriguing look at how the final match is prepared for, with the inclusion of first hand accounts by members of both the Dutch and Spanish national teams (who contested in the final of the 2010 FIFA World Cup). Before we go any further, it must be noted that this is about as official as it gets as a production. It might have said in the credits list that Daniel Gordon directed it, but this is as close as it gets to have FIFA or Sepp Blatter credited as the director instead without having Daniel resorting to Alan Smitheeing his name. There are pros and cons with that, which we’ll get into that shortly. Soccer City: a wonderful stadium. I know, I’ve ‘been’ there. 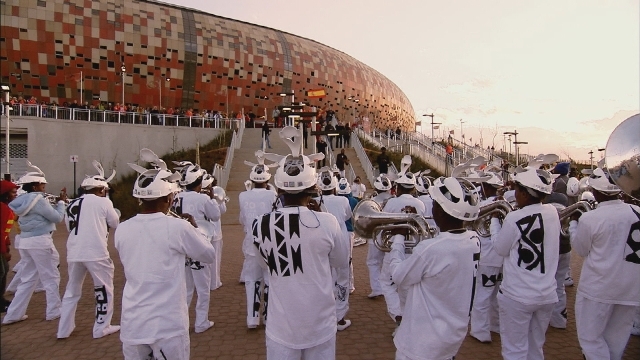 The documentary starts out with (lots and lots of) establishing shots of the Soccer City stadium in Johannesburg, the site of the final. We see the pitch side workers prepare for the biggest match of their careers; unlike many of the other stadiums, Soccer City will of course continue to be used as a football stadium (including a South African victory over Spain that initially never ‘happened’), but you literally cannot get any bigger than the final match of the world’s most prestigious tournament. They detail the details that go into the maintenance of the pitch. The precision with which they work is astounding, and this is the good side of this documentary, as it gives a voice and face to those who would never have emerged from the shadows otherwise. We then jump across to another part of the city, where the locals are already rejoicing over the coming together of the world in their city and homes. The World Cup, for better or worse, brings people together from all over the world, and it is one of the chances the hosts get to stand in the spotlight and be counted for. For some, this is a chance to portray a more positive face to South Africa and the continent as a whole, while others look for an expose on every corner that is surely waiting to be written. The sailors are enjoying their off day on shore. Therein lies the conundrum of these productions. They have a tendency to offer imbalanced accounts, often slanting towards brown nosing the moneymen. In this case, that is FIFA, the world’s governing body and the organisation that made over $3.5 billion dollars from the sweat off African backs. You will not see the kind of political crackdown and dissent from the public, on how the expenditure could have been better used elsewhere. What you will see, though, is the happiness of those who were happy to be involved, even when they know how they’d be left with nearly nothing after the tournament. “Tomorrow our country will be a lonely place. Like every party, the party must end.” This is genuine, but be aware that the other side of the many coins this party cost is not shown here. Before it ends, though, the party continues. The documentary showcases the refereeing team as well, led by Howard Webb. The Englishman became one of the few to take charge of both the European Champions League and World Cup finals in the same year; word is the Dutchman Bjorn Kuipers is to follow in his footsteps this year (provided the Netherlands do not make the final again this year, of course). We see the referees (along with the linesman and fourth official) being briefed by a senior official about how they should let the game flow for as much as possible, taking into account the pressures the players would be under. It is actually very commendable, and this insight helps me to understand a bit better how referees prepare for the World Cup. 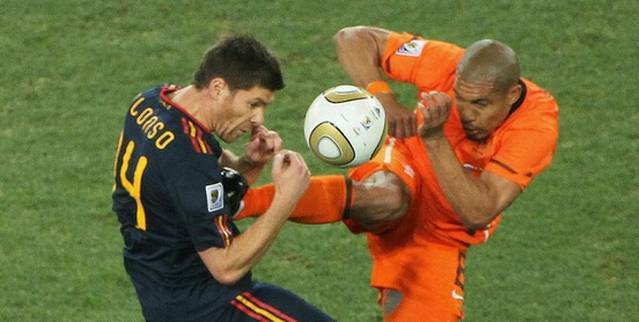 A previous review, ‘The Referee’, was insightful, but as I wrote, “what started as an objective look at the life of referees quickly turned into a small biography of Martin Hansson.” Webb, as it turns out, let the game flow so much a kung fu kick by Nigel de Jong was not punished accordingly; Webb was probably thinking of the above when Alonso got size 9 booted in his chest. Everybody loves kung fu tackling…HUAR! Alright, let’s not beat about the bush here. Here’s the best part of the production: the biggest pro of having an officially sanctioned production is the lush production qualities. You feel like there is nothing the production team can’t lay their hands on. Want access to all the footage of the World Cup? Here’s the key to the video library, don’t forget to lock it when you’re done. Fancy a time-lapse shot of the sun setting from inside the stadium? Take this security tag with you; it’ll open any doors you want. How about a sit down one on one exclusive interview with the man who scored the goal in the World Cup final? We’ll message you his phone number, but make sure it doesn’t leak to the press, alright? And on it goes. Money is truly no object in this regard, I feel, and the end result is an astounding piece of work that manages to encapsulate different enough perspectives and delivered in an eye-catching manner. With the exception of the teams’ dressing rooms, I feel like I was as close to Soccer City as I possibly could without being there. The rain in Spain was made of champagne. Kudos, then, is given to Nick Bennett (the film’s director of photographer) and Nick Packer (the editor), amongst many others, for putting together an interesting film; if you happen to have been cast away like a Tom Hanks’s shaped frog under the coconut shell on an island somewhere and not know the result of the match, it may even make you jump a few times.